The Curiosity rover investigated an area on Mars named Hottah, which appears to be part of an ancient riverbed. LONDON — Water, water everywhere, and some of it fit to drink. That’s the picture of ancient Mars that has emerged during the past few months thanks to discoveries by NASA's Curiosity rover, which has been exploring the Red Planet since touching down inside Gale Crater in August 2012. During many sessions at the conference, which was held Sept. 8 to Sept. 13 in London, scientists presented details of the rover’s most exciting finds, made before it began the long drive toward the towering Mount Sharp this past July. "We know that on Mars there was what we interpret to be a habitable environment, where water was good enough for us to drink," Melissa Rice, of the California Institute of Technology in Pasadena, said after a presentation on imaging results from Curiosity’s workhorse Mastcam instrument. "We know that we had an initial habitable environment when these rocks formed, and then sometime later — we don't know when — these rocks had water flowing through them, through these fractures, leaving calcium sulfate behind," Rice said. "We don't know if that era would have also been habitable, but it tells us that there were at least two major wet stages." "It’s amazing that we found a mudstone," said presenter Aileen Yingst, a Curiosity science team member from the Planetary Science Institute in Tucson, Ariz. "Mudstones mean that you have very fine grains inside the rock — meaning that these grains settle down slowly. On Earth, that usually means that it happened because of wind or water. And we think that it was probably water." "If you’re a microbe that is trying to get a hold on a place to live, you don’t necessarily want to be living in churning water; it’s not good for you to start growing and thriving," Yingst said. "[Calm lake] water is a better place to live." 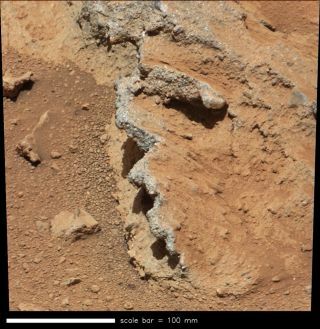 This image from the Mast Camera (Mastcam) on NASA's Mars rover Curiosity shows inclined layering known as cross-bedding in an outcrop called "Shaler" on a scale of a few tenths of meters, or decimeters (1 decimeter is nearly 4 inches). Image released January 15, 2013. More strong evidence of Mars' wet past comes from Curiosity’s discovery of calcium sulfate veins — fissures in the surface rock that, once sampled with a laser-firing instrument called ChemCam, were shown to contain sulfate. "If you have veins, then you have had water that has some sort of rock-forming mineral solution that has dissolved in the water, transported somewhere else and then deposited again. So it’s just another indicator that you’ve had about water activity," Yingst said. "And these look exactly like the sort of features I’ve looked at on Earth formed by ancient rivers," Gupta added. "So we can tell that these outcrops are clear evidence for sustained water transport and dune migration. When they are preserved, they are recording minutes to hours of motion, and they’ve been preserved for millions to billions of years." "Who knows what’s there? I hope we find evidence for ancient landscapes, and how they changed, how environments evolved," Gupta said. "I think the door is wide open and the best is yet to come," Yingst said. "Judging from the exciting stuff that we found so far, it’s only going to get better." Follow SPACE.com on Twitter @Spacedotcom. We're also on Facebookand Google+. Original article on SPACE.com. Follow Katia Moskvitch on Twitter @SciTech_Cat.